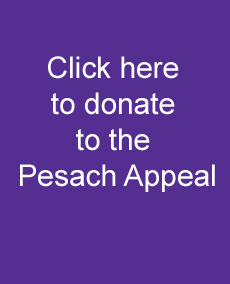 This year our Pesach Appeal will be providing over 600 food parcels across our community to families and individuals who simply can’t afford it*. The proceeds will also enable us to offer places at communal Sederim to people who would otherwise be on their own. Thanks to kind supporters like you, we are able to quietly and discreetly help and ensure Pesach is a time of celebration for everyone. While you are busy preparing, please spare a thought for those who don’t have enough money for Pesach; the people for whom everyday staples are a struggle. Help us to support them. Please help us ensure everyone in our community can enjoy Pesach. *If you are aware of people who may need help this Pesach please contact your shul in confidence.